In the mid-90’s, a script by newcomer Andrew Kevin Walker called SE7EN (a stylization of “seven”) was making the rounds and generating excitement all over town. Readers and creative executives alike hailed its bold, original storyline and that ending. That audacious, coup-de-grace ending that nobody saw coming. That ending that could possibly never be put into the finished film and thus had to be rewritten and castrated into oblivion for fear that its inclusion could break cinema itself. Indulgent hyperbole aside, it was the ending that cajoled a young David Fincher back into the director’s seat that he had so publicly sworn off after a catastrophic experience with his debut, ALIEN 3 (1992). 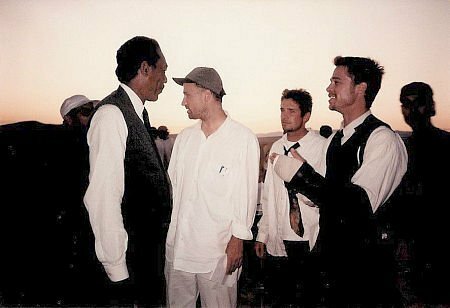 While Fincher didn’t have enough clout on his own to drop mandates that the original ending would remain as written, his stars (Hollywood heavyweights) Brad Pitt and Morgan Freeman did, and they used that clout to back up this untested auteur. As such, Fincher was in an enviable position to infuse this hauntingly original story—free from the baggage of franchise—with his unflinching style and uncompromising vision. 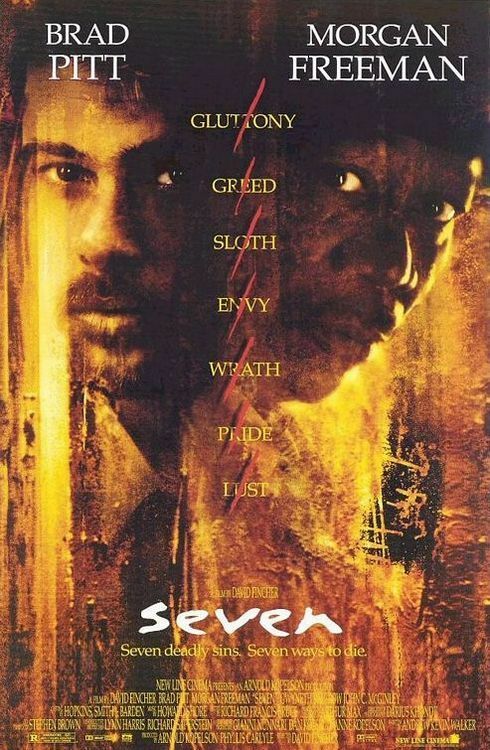 SE7EN takes place in an unnamed, crumbling metropolis of perpetual precipitation and endless blight—an oppressive environment where hope goes to die. Detective Somerset (Morgan Freeman), a longtime member of the city’s police force, is in his last week of retirement, with a young, headstrong detective named Mills (Brad Pitt) arriving in town to take his place. On their first day together, they are called to a murder scene where an obese man has been forced to literally eat himself to death. Initially assuming it to be another one of the city’s routine murders—business as usual—, a similar scene at a lawyer’s office the next day (where the victim was forced to carve up his own body and the word “greed” is painted on the floor in his blood) prompts a second look at the fat man’s murder scene (where Somerset finds “gluttony” written in grease behind the fridge). This discovery prompts the detectives to realize that they are in the midst of a killing spree perpetrated by a psychopath who carries out his murders in accordance with the seven deadly sins and leaves behind grisly scenes that taunt and challenge his pursuers. With the days passing and the bodies piling up, Somerset and Mills must race against time to deduce the killer’s identity and stop him before his grand plan reaches its shocking and grisly conclusion. Morgan Freeman is pitch perfect as the insightful, bookish Detective Somerset—a man haunted by the mistakes of his past and the city that threatens to consume him. His presence lends a great deal of gravitas and authority to the film, grounding the outlandish story developments in reason and logic and making them all the more scarier because of their realism. Brad Pitt’s performance as the hotheaded, impatient Detective Mills is interesting in that the performance itself tends to be wooden at times but we as the audience are still pulled into his swirling emotional whirlpool. Perhaps it’s only because Pitt has become such a sublimely subtle actor in the twenty years since that his forcefulness in SE7EN reads now as a younger man struggling with inherent talent but an unpolished craft. Mills’ impatience and stubbornness is well set-up throughout the film—when assigned a handful of heavy philosophical books by Somerset, he opts instead to read the Cliff Notes versions. Because he takes shortcuts and is quick to action without necessarily thinking things through, he’s in a prime position to be manipulated by Spacey’s John Doe and play into his twisted, murderous scheme. Speaking of John Doe, Kevin Spacey absolutely murders it as SE7EN’s creepy, calculating killer (puns!). Spacey imbues this psychopath with a degree of intelligence and brilliance that one doesn’t necessarily expect in their garden-variety serial killer. For Doe, his life’s work IS his life—he has no job or relationships to speak of, only a single-minded focus to complete his grand plan and etch himself permanently into the criminal history books. As evidenced by Netflix’s HOUSE OF CARDS series, Spacey is at his best under Fincher’s direction, and their first collaboration together in SE7EN results in the actor’s most mesmerizing performance in a career stuffed with them. While the potency of SE7EN’s story hinges on this trifecta of brilliant performers, Fincher doesn’t skimp in the supporting department either. He enlists Gwyneth Paltrow (who coincidentally was dating Pitt at the time) to play Pitt’s supportive, sweet wife, Tracy. Paltrow has something of a bland reputation of an actress, but collaborating with auteurs like Fincher, James Gray, or Paul Thomas Anderson bring out the very best in her and remind us why she’s an excellent actress. Paltrow takes what could easily be the standard non-confrontational, supporting house wife stock character and infuses it with a creeping pathos and dread— grappling with moral conflict over bringing a child into the dark, overbearing world that Fincher has created on-screen. In another nod to director Stanly Kubrick’s profound influence on Fincher, FULL METAL JACKET’s (1987) fire-and-brimstone drill sergeant R. Lee Ermey shows up here as Somerset’s weary precinct captain. Additionally, John C McGinley shows up against-type as a militaristically macho SWAT commander, as does Mark Boone Junior as a shady, scruffy informant to Somerset. To accomplish his stark, pitch-black vision, Fincher enlists the eye of cinematographer Darius Khondji, who is able to translate Fincher’s signature aesthetic (high contrast lighting, cold color palette, silhouettes and deep wells of shadow) onto the 35mm film image. The film is presented in the 2.35:1 anamorphic aspect ratio, but in watching some of the film’s supplemental features (and with no other evidence to go on), I’m convinced that Fincher and Khondji didn’t actually shoot anamorphic. It appears the 2.35:1 aspect ratio was achieved via a matte in post-production, which plays into Fincher’s reputation as a visual perfectionist who uses digital technology to exert control over the image down to the smallest detail. This control extends to the camera movement, which uses cranes and dollies for measured effect, echoing John Doe’s precise, predetermined nature. In fact, the only time that Fincher goes handheld is during the foot-chase sequence in Doe’s apartment complex and the finale in the desert, both of which are the only moments in the film that the balance of control is tipped out of any one person’s favor, leaving only chaos to determine what happens next. While SE7EN was filmed in downtown Los Angeles, Fincher intended for it to stand in for an unnamed East Coast city, which he successfully achieved via a mix of careful location selection and production designer Arthur Max’s vision of oppressive decay. A never-ending, torrential downpour of rain amplifies Fincher’s signature grunge aesthetic, although its presence was initially less about thematics and more about creating continuity with Pitt’s scenes (who had to film all of his part first before leaving to work on Terry Gilliam’s 12 MONKEYS). Howard Shore crafts an ominous score that utilizes a particular brassy sound evocative of old-school noir cinema, but its’ in Fincher’s source cue selection that SE7EN’s music really stands out. He uses a cover of Nine Inch Nails’ “Closer” for the opening credits, foreshadowing Fincher’s later collaborations with NIN frontman Trent Reznor on the scores for THE SOCIAL NETWORK (2010) and THE GIRL WITH THE DRAGON TATTOO (2011). Other standout cues include a Marvin Gaye track playing in the Mills apartment, and—in another nod to Kubrick—classical arrangements that waft through the cavernous library Somerset conducts his research in. It’s also worth highlighting SE7EN as Fincher’s first collaboration with Ren Klyce, who would go on create the visceral, evocative soundscapes of Fincher’s subsequent films. Overall, SE7EN is a supreme technical achievement on all fronts— a fact realized by the studio (New Line Cinema), who then mounted an aggressive awards campaign on the film’s behalf. Only Richard Francis-Bruce’s crisp editing was nominated at the Academy Awards, with neither Fincher nor his stellar cast getting a nod. Despite the cast turning in great, truly original performances, it’s apparent that Fincher’s emphasis on the visuals and the technical aspects of the production came at the expense of devoting as much energy and attention to the performances as he probably should have. The result is a visually groundbreaking film with slightly wooden performances, despite the cast’s best efforts and a first-rate narrative. An oft-mentioned aspect of SE7EN is its haunting opening credits sequence, designed by Kyle Cooper. The sequence acts as a preview of John Doe’s meticulous psychosis, with jittery text trying to literally crawl away from the disturbing images that we’re shown in quick, rapid succession. Shot separately from the main shoot after the original scripted opening credits sequence was trashed, the piece both pulls us into this sick, twisted world and prepares us for what comes next. The sequence was shot by late, great cinematographer Harris Savides—who would go on to lens Fincher’s THE GAME (1997) andZODIAC (2007)—and edited by Angus Wall, who has since become one of Fincher’s key editors. Fincher, more so than a great deal of his contemporaries, uses the opening credits of his features to set the mood and the tone of his story in a highly creative and stimulating style. His incorporation of the technique began in earnest with SE7EN, but the practice hails back to the work of Alfred Hitchchock, who pioneered the idea of opening credits as part of the storytelling and not just an arbitrary device to let the audience know who did what. SE7EN is one of the earliest instances in Fincher’s feature filmography in which his aesthetic coalesces into something immediately identifiable—no small feat for a man at bat for only the second time. The film places a subtle, yet strong emphasis on architecture—specifically, an early twentieth-century kind of civic architecture seen in noir films and old New York buildings (a mix of classical and art deco). There’s a distinct claustrophobic feeling to the city Fincher is portraying, which is reinforced by his framing of several shots from a low angle looking up at the ceiling (implying that the walls are closing in around our characters). Fincher’s fascination with technology is also reflected in a mix of cutting-edge forensic tools and outdated computer systems that are used by the protagonists to find their man. Lastly, a strong air of nihilism marks Fincher’s filmography, with the incorporation of its philosophy giving SE7EN its pitch-black resonance. Several story elements, like the moral ambiguity of Detective Mills, the rapid decay of the city aided and abetted by uncaring bureaucrats, and the darkly attractive nature of John Doe’s crimes cause a severe existential crisis for our protagonists. SE7EN was a huge hit upon its release, and put Fincher on the map in a way that ALIEN 3 never did (or could have done)—precisely because it was an original property in which Fincher could assert himself, free from the excessive studio needling that plagued top-dollar franchises back then (and still today). This freedom resulted in one of the most shocking thrillers in recent memory, jolting audiences from apathy and re-energizing a fear response that had been dulled by the onslaught of uninspired slasher films during the 80’s. SE7EN, along with Fincher’s other zeitgeist-y film FIGHT CLUB (1999), is frequently cited as one of the best pictures of the 90’s, perfectly capturing the existential, grungy essence of the decade. Above all, SE7EN is a gift—for Fincher, another chance to prove himself after the failure of ALIEN 3, and for us, a groundbreaking new voice in the cinematic conversation. That, my friends, is what was in the box. SE7EN is currently available on high definition Blu Ray via New Line Cinema.